$1,509.00 This may be in stock for quick delivery; please call! Designed primarily for outdoor use, the King 1117SP utilizes strategic bracing and unique acoustical design to make the ultimate powerhouse trumpet. 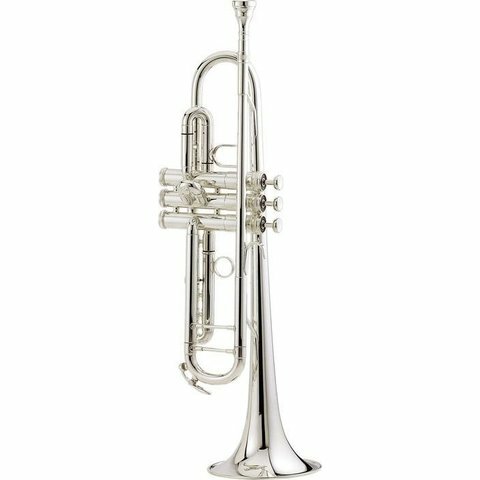 With its oversized bell, slightly slanted bell bend and large bore size, this trumpet is built to project all the way to the press box. 1st slide thumb saddle and 3rd slide finger ring allow for easy intonation adjustments. Nickel plated pistons provide smooth, quick action and unmatched durability. The heavy duty marching case is designed to be stackable to minimize space requirements. Silver-plate finish. King "Ultimate" - Key of Bb, .462" bore, 5-1/8" dynamically angled seamless yellow brass bell with soldered bead wire, nickel plated pistons, nickel inside slide tubes, soldered-on 1st slide saddle and 3rd slide finger ring, 3rd slide stop screw, clear lacquer finish, CKB 3C mouthpiece, 7827C plastic shell case.